At 13:30 to 14:00, there was already comfortable and friendly gathering in the venue for the meeting. Cosmos TMC is very well known to its friendliness. Members are busy in preparing for the meeting; setting up the PC/Projector, making sure if all the rolet, akers were on time and welcoming guests. On 14:00 sharp, Yuka-san, Ayako-san and Seiken-san performed a Yoshimoto Enterprize-like funny skit to introduce a new role was introduced; a Reaction Counter in order to activate the meeting. Yukimasa-san showed us a real-time demo on a new video conferencing software; ZOOM, which enables people in distance connected. He demonstrated a virtual TMC meeting with testimonies of the participants in the past. I truly felt that it is a perfect device for a TMC meeting for busy people. Miao-san spoke about her first Bungee Jumping. Her story was so realistic and I felt as if I were there at the jumping board with her. Her lesson was that there will be a way when we take a step forward with courage despite of any fear beforehand. Ryoko-san spoke about her challenge to change her behavior toward others. A little change we make shall cause the world surrounding us to be changed a bit by bit. I am always amazed that she does not use any note during her speech. Yuka-san delivered a cute and interesting Rakugo-story. She used vocal variety to take on different personalities quite well. But I wonder why both the master and the servant thought that the toilet was the safest place to hide thing in the house. Shigetaka-san took the role right before the meeting to fill the vacancy. Thanks. His theme was the mind waiting for spring. Three speakers; Fuyo-san, a Guest (1st timer; Good try!!) , and Kento-san (a TM guest). Kento-san showed a good example of “Body speaks”. All the evaluators (Yasuo-san, Ken-san, Tamaho-san and Tsubasa-san) did a great job, telling both good points and suggestions for further improvements. Both Yasuo-san and Tamaho-san explained these points using the words used in the speeches, which are convincing. 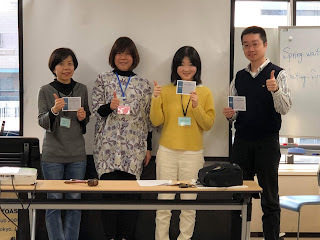 After regular meeting, we welcomed Pathways guide TM Koji from Sendai and he made a presentation about Pathways, new educational program of Toastmasters.We learned a lot. 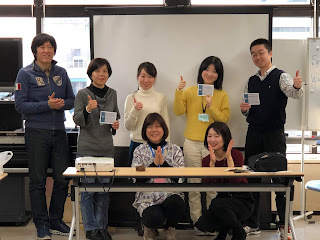 Next meeting on 17th February will be Club Speech Contest ！We will have totally 10 Contestants in English and Japanese. Don’t miss the warm-hearted welcome from the members of Cosmos TMC when you visit one of these meetings!